This article explains in detail how Reverse Port Forwarding Wizard software works. 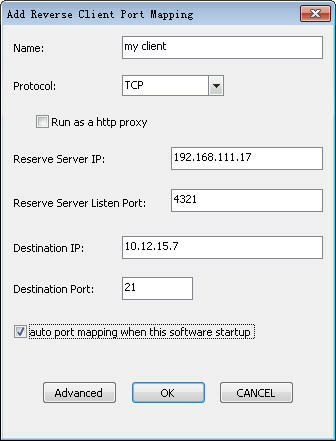 The first step of using Reverse Port Forwarding Wizard is add a reverse port mapping.You should deploy Reverse Port Forwarding Wizard on a computer that can directly access your target remote computer and add a port mapping of reverse client.Secondly,you should deploy Reverse Port Forwarding Wizard on your local computer and add a port mapping of reverse server.The port mappings of reverse client and server will work together to bridge communication between your local computer and target remote computer. click Add button to add a port mapping of reverse server. 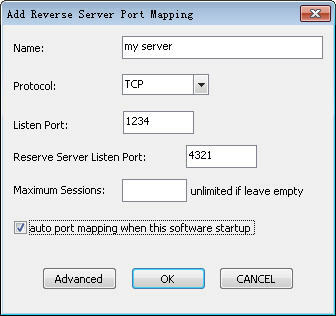 Listen port is the port that Reverse Port Forwarding Wizard will listen.When you try to access this port,Reverse Port Forwarding Wizard will forward your access to target remote computer.Reverse Server Listen Port is the port that reverse client will connect to,you can choose a port number that your local computer's firewall will not block.Maximum Sessions means the max connections of Reverse Port Forwarding Wizard will handle. 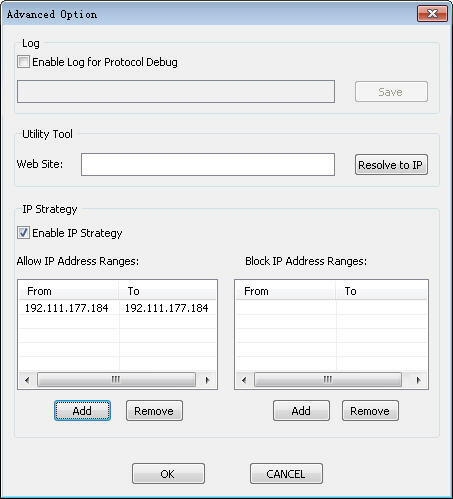 If you select the checkbox "Enable Log for Protocol Debug",Reverse Port Forwarding Wizard will log protocol data that go through it into a log file.This is a greate helper to debug or learn network protocol.Utility tool is a tool that can let you resolve a web site domain to an ip address. "Enable IP Strategy" is a option that check or don't check ip address that accessing Reverse Port Forwarding Wizard.If you select this checkbox,you can add allow ip address ranges and block ip address ranges to define what ip address can access Reverse Port Forwarding Wizard. After you have successfully deployed Reverse Port Forwarding Wizard on your local computer,you should deploy Reverse Port Forwarding Wizard on a computer that can directly access your remote computer and add a port mapping of reverse client. If the service on remote computer you want to access is a web service,you should enable "Run as a http proxy" option. Reverse Server IP and Reverse Server Listen Port is the value of your reverse server's ip address and listen port,reverse client will connect to this ip and port and work together to bridge communication between your local computer and remote computer,this is the way you can access computer that behind a firewall or inconfigurable computer.Destination ip and port is the value of your service that you want to access on the remote computer. Select a port mapping and click start button to start the services of reverse server and client,then you can use the reverse port forwarding service. Status is "running" means this port mapper have already started and Sessions means the count of connections that the port mapper have already reverse tunnelled. Reverse Client Status is "connected" means the reverse client has already connected with the reverse server. The reverse server and client are ready to do reverse tunnel for you. You can manage your router's port mappings by click "Router" menu and "Management" sub-menu. You can view,add or delete your router's port mapping here.You can click "test" button to check if your router has already opened the port you want. Also,you can click "Port Forwarding Tester" sub-menu to check other ip and port to see if the port is opened by target ip. 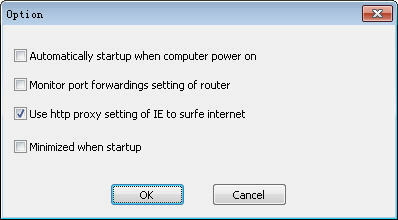 If you choose option of "Use http proxy setting of IE to surfe internet",then reverse client will access upstream http proxy to access the web service on your target remote computer or on internet. 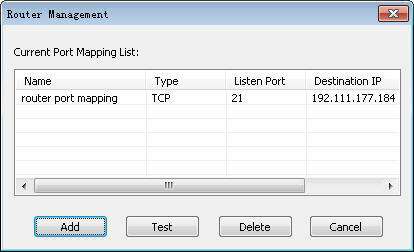 At the same time,you can monitor which ip have connected with Reverse Port Forwarding Wizard by click menu of "Reverse Port Forwarding Wizard Monitor".You can view and search often used ports by a lot of applications by click menu of "View Often Used Ports".You can enable or disable the option of "Auto Startup when computer power on" by click menu of "Option". You can click "View IP" menu to see your computer's local ip address and external ip address. A greate function is that Reverse Port Forwarding Wizard will flash try icon to let you know that network data are travelling through it. All those functions together,Reverse Por Forwarding Wizard is a very powerful reverse port forwarding and reverse tunnel software.